Summer is almost here and it’s time to hit the open road for the next great vacation! Unless of course, it isn’t. Some recent economic crises have made spending money on an extravagant vacation rather passé, and have contributed to the rise of the “staycation.” We are all for wise spending and cutting corners, so if you are taking your vacation at home this year, we can help you create a vacation-like space with a few inexpensive additions. Spas, tropical cabanas, and cruise ships all have something in common (beside drinks with tiny umbrellas): They all make good use of curtains. You can do the same to create a vacation-like atmosphere at home this summer by hanging pergola curtains. There are two main reasons to put curtains on your pergola. The first is function: A light blocking curtain can keep the area cool, and the sun out of your eyes as evening approaches; and sheer mosquito netting hung all the way around will keep you bite-free for the whole night. 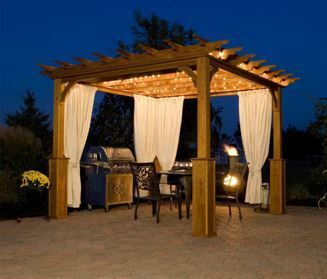 The second is style: If you like to entertain, adding some texture to your outdoor area in the form of decorative Pergola curtains will add warmth to the décor and draw people in. A few light curtains with custom tie-backs will create a tropical cabana feel in your own backyard. Grab a cool drink, put your feet up, and relax. The only thing you will be missing is the waiter. We have some easy-to-install products that work really well for this application. Our low-profile ceiling mount track is practically invisible once the curtain is hung, can be drilled directly into the horizontal beam, and is compatible with several kinds of carriers, the simplest of which is the button carrier with stainless steel hooks. Many of our tracks can be ordered in straight or ninety-degree bent sections, but if you plan to install a track all the way around the pergola, your best bet is the Flexible Curtain Track, which can be bent by hand as needed. We have lots of ideas about how to use curtains to make your home “staycation” ready. Give us a call at 888-434-7444 to discuss!